Madame Mistress Damask Burgundy Red PVC Coffin Backpack by Rock Rebel [HB80DAMASKRED] - $61.99 : Mystic Crypt, the most unique, hard to find items at ghoulishly great prices! 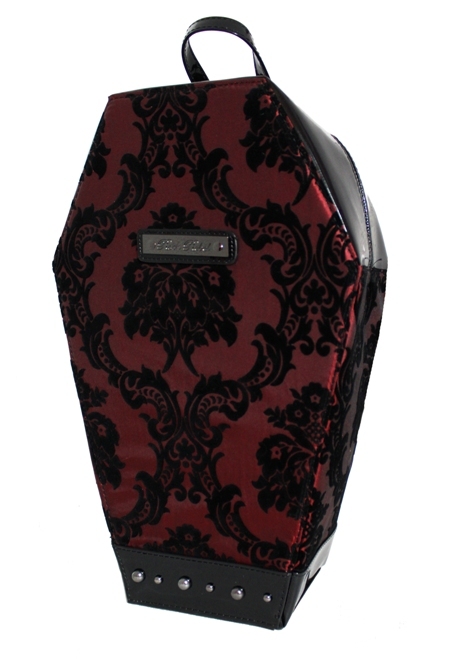 This coffin-shaped backpack from Rock Rebel features Damask print and vinyl PVC trim. This bag is made with a wipeable type satin canvas material and has velvet embossed Victorian damask print that has a textured velvet Flocking on top, with shiny studded vinyl. It has thick PVC type material trim. Made of thick PVC material on the bottom and trim, with circle studs on the front. Small Rock Rebel badge on front. Inside has black and white spiderweb printed lining and Rock Rebel label. There is a long velcro pocket inside. Zipper closure. Adjustable straps. (straps will adjust from 22 inches, all the way up to 38 inches) Made of black shiny Vegan PVC pleather material. This backpack purse measures 14 inches tall, 9 inches wide, and 4 1/2 inches in depth, very roomy.